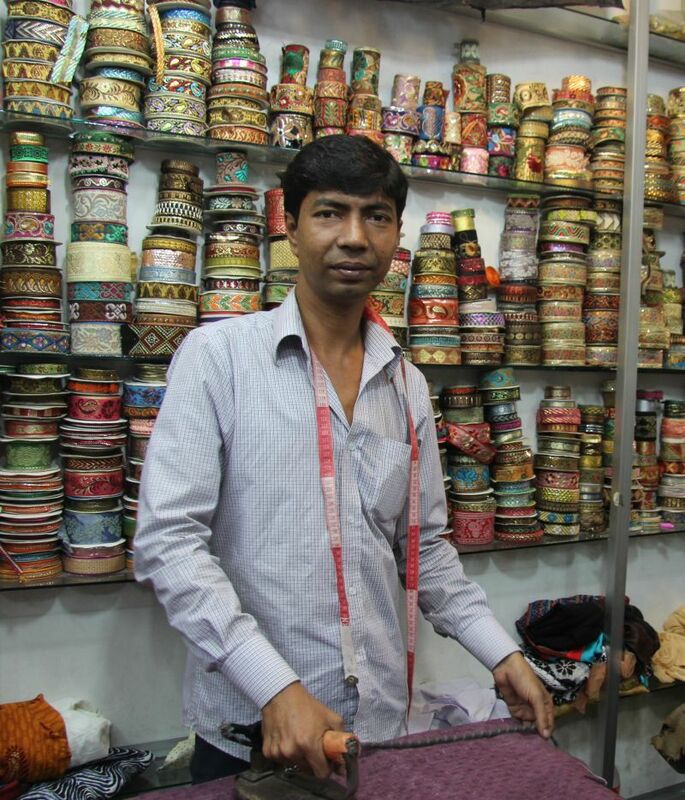 This is my tailor, Anwar bhai. 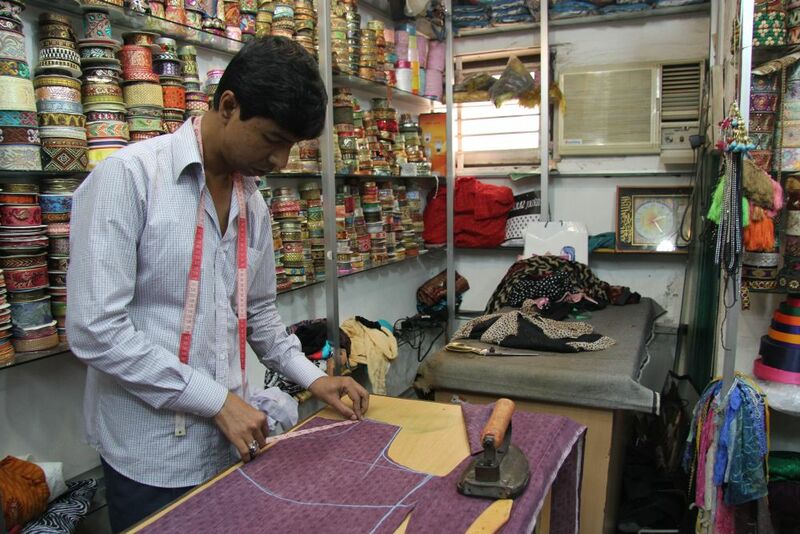 He has a shop in Banani Bazaar in the second floor in a tiny shop where with his apprentices, they stitch hundreds of dresses for customers a week. I was introduced to Anward bhai by my friend Rifaiyat’s mother when I first came to Bangladesh. Rifaiyat is currently a senior at Wellesley College, and when she had first heard that I was going to Dhaka on a Fulbright, she insisted that I call aunty who ‘loves to be able to help and asked for help’. Aunty has always worn something new every time I saw her. 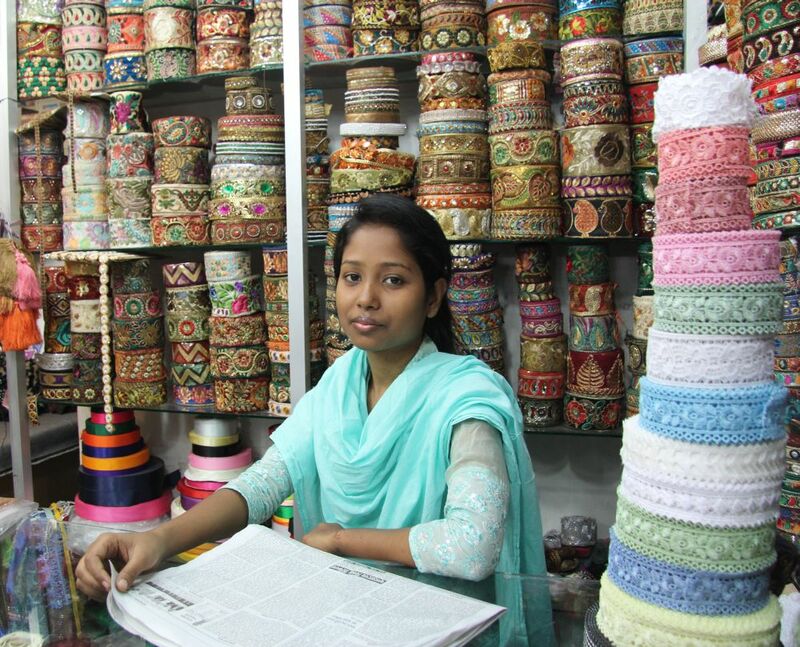 She also has two tailors and has been my go-to person in Dhaka. The natural pick to ask about a tailor recommendation- the very first step to creating a long lasting relationship. In this country, clothes are made my tailors. They are the people you go to to make the perfect kameez, tunics, pants, and saree blouses for you. The tailor, usually a male, will know your body size probably better than your significant other or your mother who fusses over your clothes. Also in Bangladesh, you don’t just go walk into any tailors. You usually come with a recommendentation from someone close to you. On the floor of Anwar bhai’s shop, Satata, there are probably at least fifty more tailors, side by side. Thus, word of mouth is how they run their business. Naturally, I asked aunty for the recommendation since you can’t just trust anyone to make clothes to fit your body like a glove. All of the stores are bustling with women, in and out. Banani Bazaar from the outside looks like a very old, dirty, and abandoned building. But on the second floor are some of the best designer stores, tailors, and also customers ranging from political wives, models, to students and expats. It is a magical space in a country that loves exclusivity. Anward bhai has been working with me for the past one year, creating amazing dresses for my everyday wear to evening kameezes. The thing I love the most about him is his supreme confidence when he measures me and makes designs (often overriding my ideas and forcing his ideas which often turns out to be better anyway). Unlike many tailors I have encountered, I never feel uncomfortable when he measures my waits, arms, thighs and shoulders. He does everything swiftly and needs very little direction. He also rarely smiles or gets angry, even when I have to scold him for giving me something two weeks late or putting a particular lace in the wrong side. I am surprised he even smiled for me in this second photo. He argues with me with the same monotone voice when I think that he charges too much. Despite our few problems, I keep returning to anward bhai because he is simply too good (most times). And he knows that I know that, too.